Swing technique and style is as unique as a hitter's fingerprint and there is not one way to swing a bat, rather in an infinite number of swing styles. But, there is one efficient way for every player to swing and it is based on what the player can physically do. 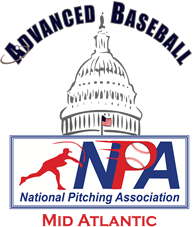 At Advanced Baseball, we utilize the information from a state of the art 3-dimensional motion capture system to develop the swing including all of the rotational speeds of the body. This provides us with a precise picture of what is happening during the swing. We will isolate any physical limitations, correlate these findings to your swing technique and prescribe a custom-conditioning program. We can then match your swing technique with your physical attributes to help you build a more powerful and efficient swing. The most efficient swing is not the same for every hitter, because efficiency is unique to their body. 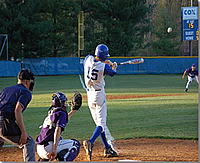 To achieve an efficient swing, a hitter must first be screened. This screen involves an assessment of swing mechanics and biomechanics, physical fitness, movement quality. Utilizing our physical screening process, we measure your ability to generate and transfer efficient energy throughout your body. Once this screen is finished, the results are used to create a plan unique for that hitter. To be successful at any level of the game requires you to be in top physical condition, mentally tough, and emotionally calm. 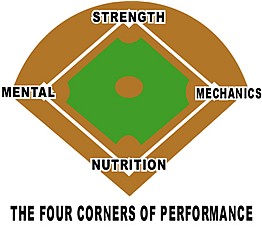 Balancing the physical and mental demands of the game is the hardest part of being a great hitter. That's why we focus heavily on the four corner of performance. 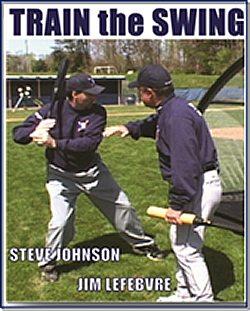 "I have been using this hitting program for years with my major league players, it works there is no question about it, all you have to do is follow the program"
"The Train the Swing program is a complete hitting system, a step-by-step training road map giving the serious dedicated hitter an opportunity to maximize their performance"
"The Train the Swing program can really help you to understand the physical preparation needed to make a real difference at the plate"
"Train the Swing is designed to bring you the information that will get the results on the field that you are looking for"